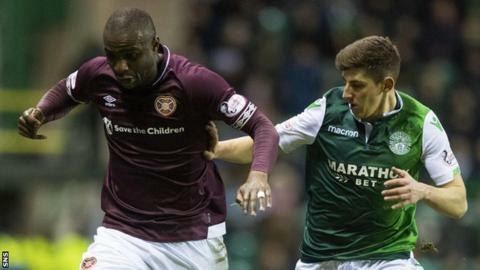 A 65-year-old Hibernian fan has been charged over the alleged racial abuse of Hearts' Clevid Dikamona during Saturday's Edinburgh derby. Television pictures from the 1-0 Hearts win showed a home fan apparently shouting at the Congo international. A Hibs spokesman described the alleged incident as "unacceptable". "The 65-year-old man has been charged and is due to appear in court at a later date," said Police Scotland's Edinburgh account. In the aftermath of the derby, match commander Superintendent Jim Royan confirmed the man had been arrested and thanked the public for their assistance. "There is no place in Scotland for hate crime and I want to reassure the public that reports of such incidents will be treated seriously," he said. "Fans have united in their condemnation of this behaviour and I want to thank the public for their assistance with our investigation so far." A total of seven arrests were made at the match, including two people for attacks on police officers. "Over 20,000 fans were in attendance at Easter Road and I want to thank the vast majority, who were extremely supportive of officers and there to just support their team and enjoy the derby with friends or family," added Supt Royan. "Despite this, and repeated warnings that anti-social and disruptive behaviour would not be tolerated, six arrests were made before and during the game. "Three people were arrested prior to the match in connection with alleged possession of pyrotechnics. Two people were also arrested before the game following the assault of two officers who were, thankfully, uninjured. "Another person was arrested within the stadium in connection with possession of alcohol." A Hibernian statement, released prior to the arrest of the 65-year-old man, said: "The club will do everything we can to identify the individual concerned and we will take the appropriate action. It's unacceptable." The previous meeting between the sides was mired in controversy after Hibernian manager Neil Lennon was struck with a coin in a bad-tempered night at Tynecastle. A man was later charged with assaulting an assistant referee, while a punch was aimed at Hearts goalkeeper Zdenek Zlamal. On the eve of Saturday's match, Hibs chief executive Leeann Dempster and Hearts owner Ann Budge told BBC Scotland they believed they were "winning" in the battle against anti-social behaviour. "Despite what happened in the last game I do actually think we are winning," said Budge.